I was starting a fire in the woodstove the other day when a question occurred to me. We build our fires by layering first tinder (crumpled newspapers), then kindling, then small splits, then finally log splits. A fire is easy to start and takes me about two minutes in the morning to get going (not counting adding log splits as the fire heats up). But... what if we didn't have newspapers to use as tinder? ...and of course tinder for fires. In fact newspapers are so easy to use for tinder that I can't imagine what I would use in their place to start a fire in the morning. So what do you recommend as a substitute? We can't depend on dryer lint because we don't use our dryer (preferring our hanging and standing clothes racks). Besides, if the "bleep" ever hits the fan, dryer lint won't be available anyway. I'm open to other ideas of what kinds of tinder people could use in a post-"bleep" situation. I know cattail fluff is good. Anything else? wood shavings, the long flat curls. We do have dryer lint in toilet paper tubes, wrapped in newspaper, that my wife made. That works great too, but I like the plane shavings. I use cotton balls dipped in Vaseline. Works like a charm. They'll flame for quite a while - long enough to get things going. I put some in a sealed container and take along on camping trips. We save all our cardboard paper towel and toilet paper rolls and use them. We always used pine pitch or candle ends that we melted and put into muffin cups. Also saved sawdust....yeah, not handy as newspapers, but it works. When we hike or walk in the forest we are always on the lookout for pine pitch and gather as much as we can. We store it in old coffee cans. Start saving your dryer lint now. Dried leaves. A tiny dab of Vaseline jelly on anything that will burn....cotton balls or save the cotton from vitamin jars or whatever....start now. Lots of stuff will be tinder. How do you come across pine pitch and gather it up? I didn't expect you could stumble into and find it in sufficient quantities. Silly... I guess that IS how you'd do it. The best tinder I have found is birch bark. There are different species; around here paper and black birch are the most common. Paper birch is the best IMHO. It's easy to gather as the birch trees "peel" themselves as they grow and you can just tear it off without harming the tree. Birch bark will burn even when wet (yes, I've tried it!) due to it's high resin content. Another good tinder is tow, the leftover stuff when flax is combed prior to spinning. Of course, dry hay, straw, leaves, etc. work fairly well, too. Your husband might have the best tinder of all right in his shop: planer shavings. You still have hives don't you? I haven't seen you mention them in a long time but I thought you did talk about them years ago. Anyway burr comb you remove from the hives works wonders as a fire starter. Outside of that the next best thing I have ever used are the twigs from a Boxelder tree. Those things start burning the second you set flame to them. When we lived in Idaho & heated with a wood-burning stove, I used finely split dry kindling several times when we were out of paper. It worked very well. I have also used empty TP tubes, paper towel tubes, and the light cardboard from food packaging, but in a down grid situation, those would probably not be available for long. Straw from the barn, bark. I used to camp A LOT when I hunted and when I would get to camp many times the available wood would be wet. I bought a plumbers torch for about $20 that screws right on top of a propane bottle and would lite my fires that way. The bottles last forever, if that is all you do with it, and are relatively inexpensive. There isn't much that won't burn when you apply a torch to it. You can get small pieces of bark burning pretty quickly with that type of heat. It's my age, but I cannot remember the name of the tree. Anyway, in the fall these trees drop what looks like dried bananas. They are excellent fire starters. Dry pine needles. Ones with a small piece of the branch attached have the next size up kindling attached...an all in one. Dried slash from the woods. If you have hardwoods, you could gather leaves and let them dry, if you don't, you could try pine needles, grass or hay might work too (I know you have plenty of that!). Some people whittle strands or splinters off of logs. In Boy Scouts we were taught to use twigs entirely, no man made tinder or starters. We use dry leaves, on 80 acres we have an endless supply. The scraps from the floor after sweeping (we get a LOT every day), hair from brushes or after trimming, scraps of fabric from sewing. Not sure if they still do or not but get a Boy Scout Book. Use to tell you how to start a fire with one match or even no matches. A small teepe fire set up in front of your small split kindling should start the thing going. waxed or oil dipped pine cones...........all lit with a match to ignite!!! Pine cones, either dried or dipped in wax make great fire starters. We would use pine cones shoved into the old-fashioned paper cups. The wax from the cup would burn long enough to light the pine cone. Once the cone was lit, it would burn for a good long time. Worked like a charm. My mom, who can't build a fire to save her life, would always use that to get a fire going. We always use pinecones that we collect through the year from our pine grove. Pick them up when dry. We store them in old tubs with lids, old coolers, etc. Then, when we empty one tub we just take it outside and get another one. Dry pine cones ignite fast. 2 words: Pine cones. I have used ones coated in paraffin and plain ones. They both work well. Leaves, bark, package wrapping (until it runs out), etc. Growing up on the farm, one of my jobs was to collect corn cobs for tinder. Mom would toss a bag full on the fireplace and it worked well. Now that we have a wood stove of our own, my question is how do I prevent it from smoking so much? Any suggestions? Keep your fire hotter and make sure you're using good, dry, seasoned wood. Also make sure you're not using cottonwood. It's nasty stuff that just smolders and puts out very little heat. Also be sure your chimney is clean and drawing properly. When I bought the one acreage in MN in 1989 there was a small collapsed chicken house on the property that had a wood shake roof, probably dated to the 1920's. The neighbors thought I was crazy, but I took those shakes off one at a time and stacked then in the granary. A handful of those in the wood stove with small kindling on top started a fire every time, and they match light. I was never stingy with them and it took me 22 years to use them all. When we lived in the wilds of WY, we didn't have paper to start fires. I would take and old knife and a hammer and cut off small shavings of wood from the log. After a while doing that I would make a pile of the shavings. Then they were kindling size (1x1). The log came next. It took some time to know what was needed to make the fire come to like, but it was lovely when it did. TP rolls, and citrus peels. My kids eat a lot of clementines this time of year. I let the peelings dry for a couple days and they light up really well and depending on how many I use at a time they sometimes even make the fire smell great for a short time. I would never have thought of using citrus peels. What a great idea! We use dryer lint, paper towel and toilet cardboard rolls, cereal and other cardboard packaging (watch for any plastics inside). We have friends at my husband's office collect newspaper for us since we read our news online. It occurs to me that, since you have cows, storing up dried cow patties in the summer would probably be a good idea. Oh...and junk mail. We had good fires during this past election cycle! Rural areas all around the world still use this product, and it's all natural. Those nice little meadow muffins you have all over your pasture, when dried make excellent fire starters. Dried dung has been used for centuries, not only as a fire starter, but as a reliable source of heat for comfort and cooking. Just my two cents worth. But, I have not tried this product, we don't raise cattle. Some friends of mine use sawdust with some diesel fuel poured in it. we have used dry pine cones and even dry sweet gum tree balls-dryer lint, vaseline on cottonballs or even a dab of vaseline on gauze- does not take much. we have also used newspapers and shredded paper (junk mail). Hello! Long time reader, very occasional commenter here. About fire starting: We have a wood stove with a catalytic combustor in the top of it. Our reason for choosing this particular wood stove had to do with exceptionally long burn times and the ability to conserve fire wood. People who live in thermal inversion areas choose catalytic wood stoves to try to avoid "burn ban" days when the local governments ban all fire place and wood burning appliance usage. Anyway, I/we are fairly new to the catalytic wood stove world, but it is our understanding that one must be particular about fire starters when dealing with that catalytic combustor. Some people avoid all news papers and cardboards with colored dyes for fear of fouling the combustor. We burn all newspaper. I don't sort out newspaper with color pictures or print but I do remove the slicks and I don't burn cardboard with colored dyes on it. I need to research the whole "paper dyes/catalytic combustor" thing but I haven't had time/taken the time to do so yet, so I err on the side of caution. So that's my first point- if you have a wood stove with a catalytic combustor, consult your owner's manual or as your local stove shop owner/stove repair tech about appropriate fire starters to keep from fouling your catalytic combustor. Second point is a question: Patrice, how do you dry bed linens indoors? I have a great drying rack that holds a full/large load of laundry but I still find it challenging to dry bed sheets inside. 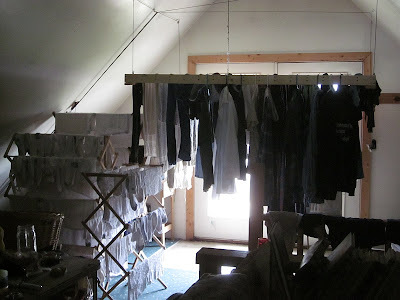 Some days, like today, it was just too damp and cloudy for the bed linens to dry on the outside line. I have them draped over the clothes rack now but in order to do so, I have them folded several times. If I hadn't hung them outside today, despite the weather, I doubt they'd dry anytime soon folded on the clothes rack. Any tips? My favorite fire starter is the leftovers from a McDonalds meal. Bag, fry container and burger box. All put back into the bag and scrunched up. My second favorite is taking a quart half and half waxed cardboard container and cutting it up into 2"x4" pieces. Fold one in half and light the end and it burns for a couple minutes. Lastly is simple red cedar. Don't need paper or anything just split a small amount into pencil sized pieces or smaller and light. Frank and Fern have it right: meadow muffins. Also char cloth. It's easy to make from scraps of cotton fabric and can be stored. I never put anything in my fireplace that has glue, colored inks or wax, as these materials can cause buildup in your chimney. I also use paper sacks after they've been reused or if they're torn. Being in the construction business, we get a steady supply of cedar shingles that can be split very fine and lit with a match. It's some of the best kindling ever. Patrice, all my suggestions were already offered by others, so I thought I'd try to come up with a new (to me) idea. We have planted quite a number of shrubs in our yard, some of which grow a few feet each season. Some need to be trimmed back hard every year. If we bundled all the trimmings from each shrub and stacked them in our garage (or in your case any outbuilding that would keep them dry) there'd be a nice supply drying out, renewable every year. That doesn't even count the wild, unidentified vegetation out in the wooded areas behind our house. I suppose there are a few plants that shouldn't be burned inside. I've been thinking along the same lines as you and have been saving dryer lint and medicine bottle cotton balls for a couple of years at least. Hubby & I make firestarters using paraffin wax and the shredded paper from his shred bin. Spray several ice cube trays with Pam, fill with shredded paper. Melt wax in a double boiler, pour into trays. Make sure there's paper sticking out to light. They work great. If you have a copy of the Boy Scout Handbook (and you defiinitely should), there is a section on how to start fires. Having been on hundreds of camping trips as a leader, I can tell you that the handbook suggestions really work. We never let the boys use lighter fluid or anything else except for what was found in the woods (pine needles, tiny sticks, etc). Bacon and hamburger grease pluss moss work pretty well. (Mmm..bacon...). We use our bacon grease for cooking but we usually have an excess. We go through about 10-15 lbs of bacon a month, and we get the culls in bulk 10# boxes from our local butcher for about 50% (or less) the going rate for bacon. We don't use our hamburger grease for cooking, but I save all of that as well, boil it down, strain it, then store it in pint jars. It makes a great emergency heavy grease in cooler weather, and it actually makes a pretty good emergency lubricant during the summer. One down side is that after boiling and straining it doesn't really have much smell (to us), however the dogs and cats absolutely love it. One time I found our son's black lab licking the wheelbarrow axle and having a grand old time of it. And if you happen to spill some in the garage or shop you'll have to work around the animals for days licking the floor. As an experiment some time ago after having this same discussion with my wife about firestarters, I collected a bunch of moss and dried it in the garage for a couple weeks. I collected three kinds. The type of hanging moss you get on trees that looks vaguely spiderwebby, the thick heavy type of moss you get in your gutters or yard, and the other kind of thicker, heavier tree moss. Take a handful of moss, roll it roughly into a cylinder, dip it into warmed (liquid) grease (best), or smear it with non-liquid grease (okay - and messy). The spiderwebby kind lit easier but wouldn't retain enough grease to keep burning. Both of the thicker mosses worked about the same. It lights okay, and if you were using this in an emergency situation it also leaves you with a fire that was started with non-chemical means and wouldn't have any potentially toxic byproducts if you were also needing to use it as a cooking fire. oh, I noticed one here... dried cow patties. that is what the Pioneers used to start their fires. I just took a peek in our paper stash and this is what I found: junk mail, cardboard cereal boxes, toilet paper rolls, crushed Kleenex boxes. Through out the year, we save odd sticks from the yard, small pieces of cut wood after my husband does a construction project, and our mainstay that really starts a fire is dried pine cones that drop from our monster-sized pine tree. We soak them in diesel fuel and keep them in an ice cream bucket (outside of course). We don't get the newspaper either, so we accept old newspapers. If we lose our normal resources for paper, I am sure a person could start burning personal papers they need to shred, books, your furniture... hope it doesn't come to that. Great ideas from all you folks! Love this site! Where I live we still (?) get three or four "phone books" each spring. I've often thought of saving these and drilling a hole in one corner to hang nearby and use a page or two for kindling (or use them as the old folks did with the Sears catalog!!) Eventually, of course, the "phone book" people will realize how antiquated the technology is, but they are compact sources of fairly soft newsprint. Also go find the Grant Thompson channel on YouTube and search for "char cloth". He shows you just how to make it using a tuna can and also why it works. He also has other fire-starting methods on his channel. Plus some cool camping/survival hints. I find that one wrapper from my butter cubes will torch any kind of kindling I have laying around. My hubby took down and replaced an old cedar fence last year and we have enough cedar kindling to last almost as long as those cedar shakes on the chicken coop! Also, I've made the firestarters with sawdust or cardboard, wax, grease, beeswax, pitch, cooking oil--whatever will burn. Don't need much. But sometimes, if the fire is "banked" correctly, I don't need to start over. Just find the embers glowing under the ashes, sprinkle with finely shredded dry cedar and add a little air by blowing gently. Keep Warm and Carry On! Dried and tight wrapped grass has always been a good fire starter. As a couple of people have posted wood shavings. But if you can look out foor and old wooden plane. It looks like a wooden rebate plane but the blade is skewed. These planes here in the UK were called a spill plane. The angle of the blade creates long tubes of shavings that not only can be used for tinder but also as lighted tapers to light candles and lamos without using matches. Paper egg cartons work well, too, and you can also use 70%rubbing alcohol on cotton, dryer lint, or a used paper towel. They are not too combustible, but will light the fire. Oh, and you can brush your cats and dogs and pop that fur right in there to get a fire started as well! Lydia looks as though she could supply quite a lot of fire-starting material! Catalytic woodstoves versus non-catalytic: We bought the non-catalytic for the reason that the converter must be replaced every few years, and it is not good for them to receive paper, cardboard, etc., and so are limited in that regard. We have been heating our home with wood for 34 yrs. For most of those years we used newspaper for kindling. The kids, now all adults had paper routes. When they stopped the routes, we still had newspapers, but then we stopped our subscription years ago. Husbands dad, a voracious newspaper reader, would save them for us, but alas, he has since passed away. Currently, my husband scavenges newspapers where he can. We have used twigs, pine cones and other such flammables. My list of what *not* to use, however is a bit longer. Paper isn't just "paper" any more. We scoop the chainsaw sawdust into a heap as we're cutting logs, then add a little diesel or used motor oil. This is stored in a 5 gallon bucket (with a lid for the smell) next to the wood box near the stove. One scoop (about a cup) works great. As for lighting material, we like to make a batch of char cloth or char paper (depending on what we have on hand) whenever we have an outdoor fire. We keep this in a sealed container to assist in lighting our fires. Old scraps of 100% cotton jeans makes awesome char cloth. We can typically buy tattered jeans for pennies at our local secondhand store. We put our cub scout grandkids to work making feathersticks for fire starting in the grill. They had to cook their hot dogs and marshmallows on wood that they gathered themselves. Pine nots come from where a branch comes off the trunk or an old pine stump,very rich in pine tar, shave it off with a hatchet good fire starter doesn't take much. Because it creates creosote. I only know papers and leaves. I couldnt imagine anymore ways to use, until I get to your post. Its informative.